The Border Patrol Agents in the US used pepper spray and tear gas to encounter rock-throwing migrants while a group of about 150 tried to cross the border without permission from Mexico and this trespassing prompted 25 arrests according to the agency. Since November, it is the second time while the officials in borders have used tear gas during a mass migrant trespassing in the San Diego area. 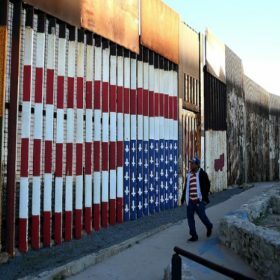 In the latest case on the eve of New Year, the migrants were among 1,500 who have lasted in Tijuana, in Mexico just South of San Diego in California, after a once 5,000 strong convoy of travellers – which boosted the ire of US President Donald Trump – mainly gave up and scattered. The journalist proclaimed the crowd size at around 100 and noticed the group of Central Americans collecting around 8:00 pm Monday night in an area called Playas de Tijuana on the Pacific Coast, often used by itinerants as a departure point for the attempts to furtive across the border. There the border is accessed with enclosure and a large vertical plate that overhangs into the water. On the other side of it, border agents of US were seen deploying. At night, the people of both sides of the borderline prepared to celebrate the eve of New Year, the itinerants tried to cross over at least two smoke bombs were fired and they were finally held back. Those who took attempt for crossing including adult men, women along with small children and adolescents. After that venture, part of the group stayed near the border and other Central reached and joined them.